Michael Mraz from Mraz Brewing joins us to follow up on his nano-brewery startup. Michael launched his own 3 barrel brewery specializing in Belgian beers in a tiny 1000 sq foot shop in the Spring of 2013, and this week he shares some of his lessons learned in moving from amateur to pro-brewer. My guest this week is Michael Mraz, an award winning home brewer who used his personal savings to establish a small 3 barrel brewery in El Dorado California. Michael is the founder and brewmaster at Mraz Brewing Company, specializing in Belgian and sour beer styles. 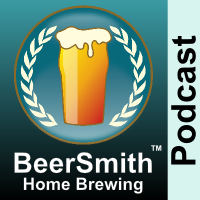 Also check out BeerSmith Mobile softwaree and , the new DVDs John Palmer and I filmed – How to Brew with Malt Extract and How to Brew All Grain are both available now. Michael brings us up to date on his brewery which we initially discussed back in episode #57. We discuss his focus on Belgian ales and sour beers – specialty beers that take a long time to create and age. Michael shares his thoughts on the tap room, which account for almost 80% of hit sales. We talk about the public’s reaction to his beer. Michael has moved to bottling many of his Belgian beers, and we discuss bottling as well as the four sample beers he sent me (which are amazing). We discuss some of the challenges of operating a small business including managing deliveries, storage space, space for aging barrels and business considerations. He shares his closing thoughts. Thanks to Michael Mraz for appearing on the show and also to you for listening! Thanks for this interview! I’m starting a micro/nano in the middle of nowhere (West Plains, Missouri), and this has confirmed much of what I was thinking in our own approach. Cheers!